Galaxy clusters like 1E 0657-56 (inset) seem to be drifting toward a 20-degree-wide patch of sky (ellipse) between the constellations of Centaurus and Vela. Credit: NASA/WMAP/A. Kashlinsky et al. (PhysOrg.com) -- Using data from NASA's Wilkinson Microwave Anisotropy Probe (WMAP), scientists have identified an unexpected motion in distant galaxy clusters. The cause, they suggest, is the gravitational attraction of matter that lies beyond the observable universe. "The clusters show a small but measurable velocity that is independent of the universe's expansion and does not change as distances increase," says lead researcher Alexander Kashlinsky at NASA's Goddard Space Flight Center in Greenbelt, Md. "We never expected to find anything like this." Kashlinsky calls this collective motion a "dark flow" in the vein of more familiar cosmological mysteries: dark energy and dark matter. "The distribution of matter in the observed universe cannot account for this motion," he says. Hot X-ray-emitting gas in a galaxy cluster scatters photons from the cosmic microwave background. Clusters don't precisely follow the expansion of space, so the wavelengths of scattered photons change in a way that reflects each cluster's individual motion. This results in a minute shift of the microwave background's temperature in the cluster's direction. Astronomers refer to this change as the kinematic Sunyaev-Zel'dovich (SZ) effect. A related distortion, known as the thermal SZ effect, has been observed in galaxy clusters since the 1980s. But the kinematic version is less than one-tenth as strong and has not been detected in any cluster. In 2000, Kashlinsky and Fernando Atrio-Barandela from the University of Salamanca, Spain, showed that astronomers could, in essence, amplify the effect isolating the kinematic SZ term. The trick, they found, is to study large numbers of clusters. The astronomers teamed up with Dale Kocevski at the University of California, Davis, and Harald Ebeling from the University of Hawaii to identify some 700 X-ray clusters that could be used to find the subtle spectral shift. This sample includes objects up to 6 billion light-years - or nearly half of the observable universe - away. Using the cluster catalog and WMAP's three-year view of the microwave background, the astronomers detected bulk cluster motions of nearly 2 million miles per hour. The clusters are heading toward a 20-degree patch of sky between the constellations of Centaurus and Vela. What's more, this motion is constant out to at least a billion light-years. "Because the dark flow already extends so far, it likely extends across the visible universe," Kashlinsky says. Cosmologists view the microwave background - a flash of light emitted 380,000 years after the big bang - as the universe's ultimate reference frame. Relative to it, all large-scale motion should show no preferred direction. Big-bang models that include a feature called inflation offer a possible explanation for the flow. Inflation is a brief hyper-expansion early in the universe's history. 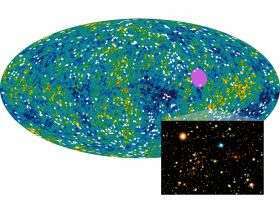 If inflation did occur, then the universe we can see is only a small portion of the whole cosmos. WMAP data released in 2006 support the idea that our universe experienced inflation. Kashlinsky and his team suggest that their clusters are responding to the gravitational attraction of matter that was pushed far beyond the observable universe by inflation. "This measurement may give us a way to explore the state of the cosmos before inflation occurred," he says. The next step is to narrow down uncertainties in the measurements. "We need a more accurate accounting of how the million-degree gas in these galaxy clusters is distributed," says Atrio-Barandela. "We're assembling an even larger and deeper catalog of X-ray clusters to better measure the flow," Ebeling adds. The researchers also plan to extend their analysis by using the latest WMAP results, released in March. The results will appear this week in the electronic edition of Astrophysical Journal Letters. This shows how fragile and speculative is our knowledge of what happens beyond the Solar System. Its not surprising tbh, its really arrogant of us to think that we can understand all of the Universe just by watching it from our tiny dot, too bad thats all we can do. Yes, but look how much we have learned from our tiny dot. It's not arrogance we suffer but a quest for more knowledge, you know, what's on the other side of the mountain. I doubt we ever know all of the universe, seems to me we always know less than what there is to know. Yeah, less is more! The longer we learn 'more' the 'less' we know! Is this a bad thing or is it just the way it is? And across these vast and flowing heavens, not a single civilization has figured out how to send out a clear, unambiguious signal announcing their existance. That's a little troubling, don't you think? We've been doing it for at least 50 years, though not on purpose i suppose. Its good to know we know little, it keeps us from believing too much. Either no civilisation(that may or may not exist) has sent any signals or we cant figure it out(yet). The old Fermi paradox. Even if they aren't using the same medium of communications (radio) the universe is so old if there were intelligent life out there we most likely would have seen their handy work by now. Anything from ringworlds to engineering the structure of their home galaxy...we don't see anything like this. I've always questioned the whole "the universe is homogeneous and isotropic" thing...Our perception only looks this way because we're only seeing things from the centre of and observational sphere. I'm sure beings on another planet in another galaxy think the same thing, but I honestly don't think it's true. IMHO, humans are far more primitive than our arrogance would allow us to suggest. Don't you think that any signal would have degraded over time to the point that it is no longer distinguishable from background interference? Do you honestly think we have the technology to accomplish this feat? Is it therefore plausible that other cultures have attempted to make contact and failed, either out of our blindness, or our attempts to shoot them out of the sky? We can barely find planets outside of our solar system. It's not really surprising we haven't detected ringworlds or other civilizations capable of communication. We know so little we cannot even comprehend the size of the vast unknown. The things we see as constant now are only because of the minute intervals of time we are measuring them in. Maybe we will live long enough, or look back far enough, to see our picture of the constant universe transform into a video of ever changing dynamics. hey.... do you realize that this could be the first real peace of evidence for inflationary universe development theory? I'm not sold on using Red-Shift to measure distance and velocity of these objects. Too many unknown variables, gravity lens and such. 'Objects are closer than they appear' kinda thing. As for Dark Matter, they are just reffering to planets/Gas/dirt/ice that don't emit light right? Why do people keep thinking 'Dark Matter' is some kind of new material? in addition, though this may sound crazy the evidence speaks for itself, why are early NASA photo's of the moon clearly selectively airbrushed whereas the same photo's released by the USSR show objects in the airbrushed areas that appear to have been made by intelligent beings? This "airbrushing" is even more prevalent w/ today's much higher resolution photos. Just look at published NASA and ESA photo's of the moon and Mars it's blatant and extensive. We're getting pretty good at detecting things actually. We could see engineering on the level of a type II and certainly a type III civilization (the former within the galaxy and the latter probably across the observable universe). We simply don't see these things...or they're being kept from us. I think that's unlikely however as even amateur astronomers should be able to see the work of a type III civilization if there were any even kind of close. Then again maybe they'd rather do other things with their time, who can say what a hyper advanced civilizaion would do...but it sure does seem very quiet out there. No. It certainly could be baryonic dark matter like you point out, but there's no existing theoretical framework that would reconsile the observed elemental abundances with the notion that nearly all dark matter is baryonic. It is quiet, but then anyone further than 90 light years from us wouldn't know we exist (assuming, like us, they're monitoring for EM patterns). Most of us probably think the idea of a space-like habitable zone (within a given galaxy) makes sense; I think it's reasonable that there may be also be a universal time-like habitable zone. In my thinking, it may well be that most civilizations arise within the same 100 million year or so period after the birth of a (the?) universe. Maybe we're early, maybe we're late. Maybe civilizations are common but short-lived. ...planet gets wiped clean... nothing much to see or hear. I don't think we should take not finding ringworlds, or galaxies with their stars rearranged in some artificial pattern, as a sign that there aren't any ancient, hyper-advanced life forms out there. Why assume levels of engineering visible from across the universe are what any advanced civilization would decide to do? These are the kinds of projects that appeal to us at our current stage of evolution, while we're still unable to accomplish them; by the time we can accomplish them, we may be uninterested in doing so, seeing them as hubris, or just not useful for whatever we've evolved into. If you've evolved into a sufficiently space-faring civilization (assuming the development of faster than light travel, or its equivalent, is possible), then why build massive habitations in one spot? There is a world (universe?) of extraordinary theories and their associated, elegant, mathematical proofs about various objects and occurrences in the cosmos, but they are still largely the theoretical musings of observers on one, small planet that dwells in an expanse so vast that it boggles (and fuels) the imagination. My Theory of Everything is comparatively simple (minus the elegant proof). The Big Bang was just another event in the life cycle of our corner of the cosmos. In a rare convergence of many objects that are best described as black holes, a critical mass was reached and the resulting explosion was called the Big Bang. The aforementioned critical mass was accomplished in our segment of the universe when Neutron Stars, Black Holes and etc%u2026 formed, merged (as galaxies collided) and were fed from the accrued stellar matter. When the merger resulted in said critical mass, the gravity well could not help but try to bring in just a little more and BANG went the overloaded system. Thus was our segment of the universe begun; again. This would cause old galaxies being observed at distances that should have been too near to the time of the Big Bang for a galaxy to form, to be remnants that have drifted in from other areas of this extremely massive, more so then can be easily understood, universe that were not effected by our local BANG event. Under this sequence of events the theory of everything would be: E=mc2. That is, everything is cyclical and nothing is ever lost (changed catastrophically, but not lost). Does this mean space is, or is not, curved? It does not matter. If space is curved it would appear that the arc is so huge that we have not seen (or perhaps not recognized) the horizon yet. Does this mean the speed of light is the maximum attainable velocity? Not relevant, but I hope not. What about dimensions beyond the three we can sense? Maybe real, but they are currently just wonderfully imaginative speculation. What about strings? These are also great works of imagination. As an amateur observer of the mystical art and science of cosmology and astrophysics, I would say a complete review of current theory and practice, using Occam s razor, might be appropriate. Yes Heavy Duty - I must confess that your description of the probably Universe tends to Gel with mine. Why? well because I just don't like theories that describe everything as coming from nothing. Including time itself being created just to contain everything. It is just too trite. On the other hand a universal Universe seems much more sensible. Then again, one has to wonder what sensibleness has anything to do with reality. We will just have to keep looking until we see something. As for expecting to notice an advanced civilization even if we saw one - well that too is open to interpretation. Just how advanced a civilization would we be able to notice and do we really want to? Plus, of course, we have to define what we mean by advanced. Maybe those white mice really are just a trans-dimensional representation of one aspect of a really advanced life-form. But to see currents and eddies of baryonic matter in the Universe is a pleasant thing for me. I do not like to think of the Universe as a boring static backdrop to peoples crackpot ideas. Much better that the Universe has it's own ideas as to what is normal and what is not. So let there be a river across the Universe maybe powered by an electric current who cares - it is caused by something and I for one am excited to hear all the speculations as to what those causes may be. I always find it funny - ha ha - that we have theories for the expansion of the universe that include inflation (a period of rapid expansion) early in the universe followed by a slower more sedate rate of expansion that is now considered to be accelerating. We all have been led to believe that it takes a force to act on an object to change its velocity. I for one believe that is a basis of physics. We have the mysterious force that caused the mysterious inflation and the mysterious force that stopped the inflation now we have the mysterious force that is causing the acceleration. I know I am ignorant and that I am not alone in that. But too many mysterious forces does cause one to consider a rethink may be required. I wrote and published a sci-fi adventure novel based on the concept that dark matter is actually just ordinary matter purposely hidden from our view - it simply consists of many more star systems in our galaxy heavily populated by highly advanced aliens who wish to remain unseen. Why they would do such a thing and how they do it are explained in the story. In essence, such a scenario would solve both the Fermi paradox and the mystery about the composition of dark matter. Details about the book can be found on my website at www.swahmed.com.